Last weekend we went camping out on Orcas Island, my favorite of all the San Juan Islands. The trip had been on our calendar for a few months, but it seemed to sneak up quickly (hasn’t that been the case this summer?) leaving us scurrying like crazy to get out of the house Friday afternoon to catch our ferry. 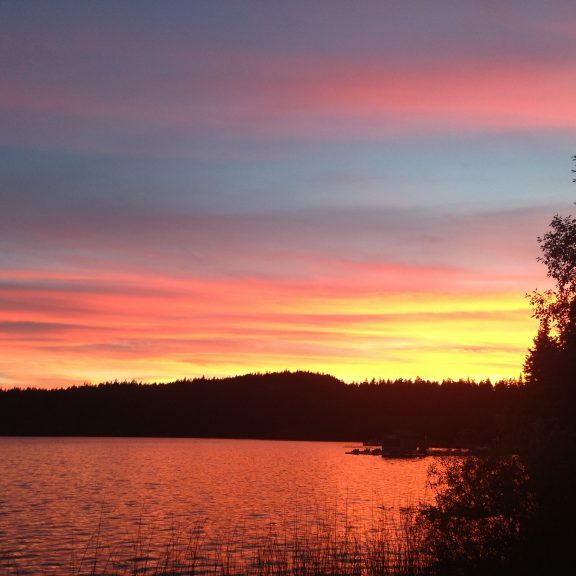 We’ve been to Orcas enough times to have a favorite swimming hole, hike, and bakery, but this trip would be different as we were going car camping with three other couples and a gaggle of kids. I knew that at 24 weeks pregnant it might not be superbly comfortable to sleep in our small tent, but we were bringing air mattresses and I packed my pillow so surely all would be well. The day before we left I baked a loaf of this banana bread and stocked up on healthy snacks and fizzy water. Sam dug through the basement to find all of our camping gear. We were ready. A few friends commented that they couldn’t believe I was going camping pregnant, but really let’s face it, it was car camping right by a gorgeous lake and we had fresh banana bread: how bad could it be? And for the most part, I seem to have an interesting reaction to many of the negative comments or warnings I hear about pregnancy: I tend to take it with a weighty grain of salt. I know that I’ve been very lucky in not feeling sick and having relatively good energy, and I’m fully aware that this isn’t the case for many people (and that it could also change for me). I also know that I’m a ‘mind over matter’ kind of gal which has served me pretty well so far. When I ran marathons a few years ago, you get used to not listening to your body — you listen to your mind. Sure, you train smart and show up physically prepared, but on race day you often ignore all the signs your body gives you that it’d really like to stop and walk, thank you very much. Instead you listen to your mind telling you to keep putting one foot in front of the other. To be honest, this is how I’ve approached so many things in life: I assume I’ll work hard at it and it’ll work out. I’ll put my mind to it. I’ll focus and drown out the naysayers. But pregnancy is slowly teaching me that this isn’t going to work all the time. The days of talking myself into running another mile, staying up another hour, or getting up earlier to get more accomplished might just be nearing an end (for now). 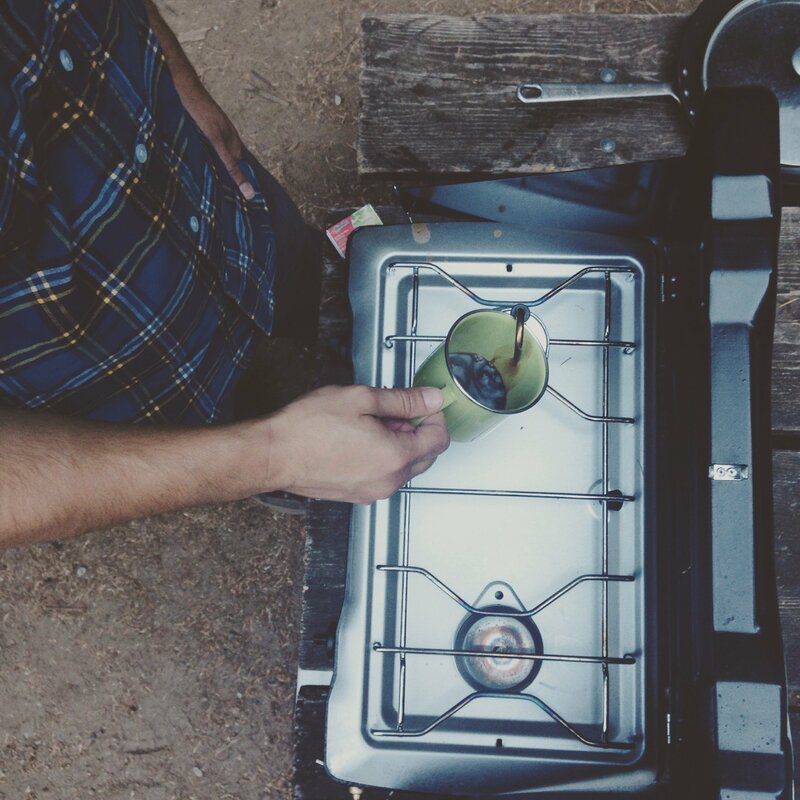 The weekend we were camping was a hot one — as we’ve been experiencing so much this summer in the Pacific Northwest. And for the first time, my ankles and calves became so swollen I could barely see my ankle bones. When I looked down one morning I thought, oh no. I’m becoming one of those pregnant women. Now, my theory with many minor ailments in life is to drink more water (those who know me well lovingly roll their eyes at my suggestion that it cures so! many! things!). But liters of water and hours later, my ankles were still stumpy and my energy was low. That evening, I figured I needed to go on a brisk walk — surely that would fix me right up. I set off by myself to explore the other campsites and trails nearby. I came back to camp, had a huge glass of water, and put my feet up. No change. Sleeping that night turned out to be far less comfortable than I’d thought and getting up in the middle of the night to pee numerous times was a challenge in our very small two-person wilderness backpacking tent. I was humbled. This of course is all very minor, but it has made me confront the fact that I’m likely not going to be the one driving the ship for the next few months. I know that as much as we prepare and as many books as we may read, my body and our baby may have other things in mind than what we expect, anticipate or plan for. As I’ve written about in my pregnancy journal, it’s good that pregnancy is such a gradual process. If you went from not pregnant to 24 weeks with a sizably round belly and baby kicks and jabs and swelling and fatigue right away it would be rather shocking. But the body eases you in slowly; now I’m just going to have to get a little better at really letting go and listening to it. I don’t necessarily have a go-to banana bread recipe so I searched through a few cookbooks that I’ve been wanting to bake from and found this beauty from the new-ish Ovenly cookbook. 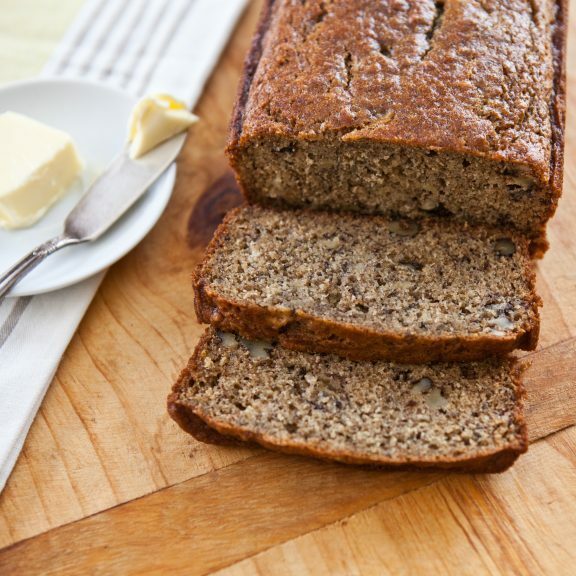 And while there are so many banana bread recipes out there and you may wonder why it’s necessary to talk about yet another, this one is special because it’s an adapted Moosewood Cookbook recipe and I appreciate that it’s largely sweetened with maple syrup and is made with whole wheat flour. 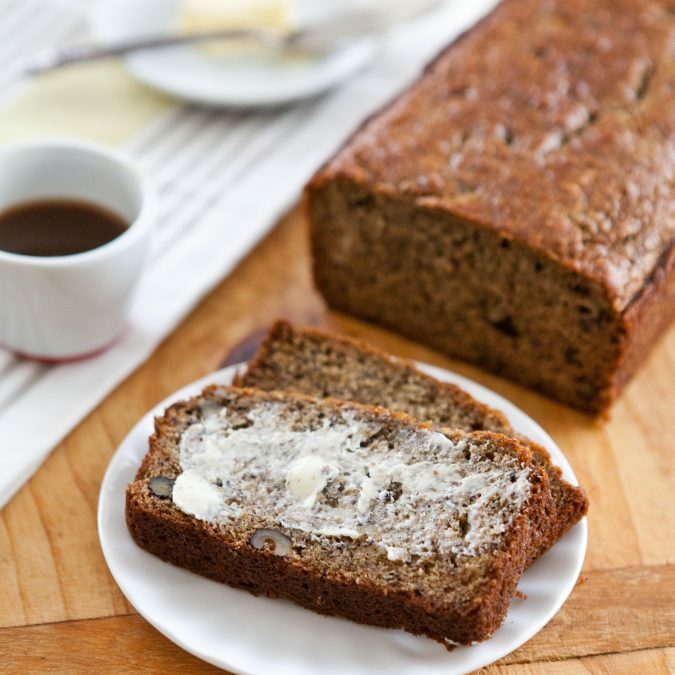 So many banana bread recipes are so delicious because they’re actually more like a cake, loaded down with sugar and oil; this one looked different and called to me. It turned out to be a hit in the mornings. We unwrapped it and kept Sam’s camping knife close by to slice away small pieces. With campsite coffee and slightly cooler mornings, it really hit the spot. The Ovenly ladies call for canola oil in their recipe but I opted to use coconut oil instead; it has a really wonderful sweet fragrance that works well with the flavors in this bread. If you don’t have coconut oil, you can certainly use a canola or vegetable oil instead. I also added walnuts because I happen to love nuts in my banana bread. You could leave the nuts out altogether if you prefer or make this loaf a bit more indulgent by adding chocolate chips. It’s wonderful sliced at room temperature or toasted — always with a little butter. Preheat the oven to 350F. 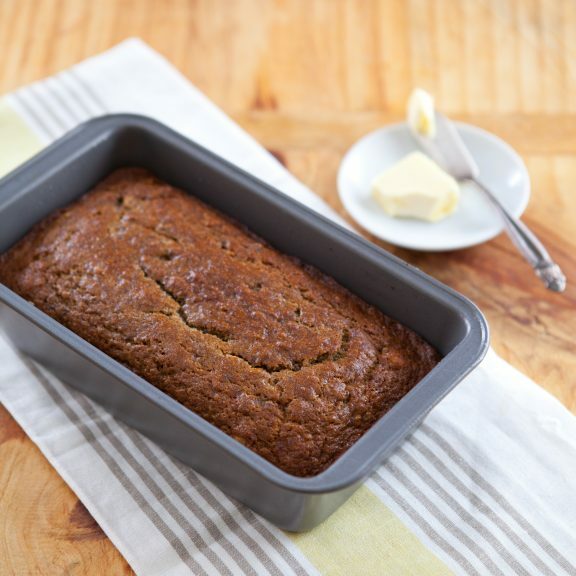 Liberally grease a 9×5-inch loaf pan with butter (or non-stick cooking spray). Peel the bananas and place in a small bowl. Mash with a fork until smooth. Separate out 1 cup of the banana mash. If there is extra, feel free to freeze in an airtight container for future use (smoothies, top your yogurt or oatmeal). Grind the flaxseeds into a fine powder using a coffee or spice grinder. In a medium bowl, whisk together the flours, flaxseed meal, baking powder, baking soda and salt. Set aside. In a large bowl, whisk together the maple syrup, eggs, oil, brown sugar and vanilla extract. Add the sour cream and mashed banana. Whisk until almost smooth — it’s ok if a few lumps remain. Fold the dry ingredients into the wet ingredients until just combined. Don’t overmix. At the very end, fold in the toasted walnuts. Pour the batter into the prepared loaf pan. Bake for 50-55 minutes, or until a toothpick inserted into the center of the bread comes out clean. This banana bread looks great, my two year old loves to help mix so I hope we can make this soon. I'm still new at it but it seems like parenting is continually realizing that most things are out of your control. But it sounds like you are taking good care of yourself and keeping a good perspective! OHHH! I love banana bread. And camping. That sounds like the perfect combination. For Type A personalities, parenthood is a gradual and mysterious process of letting go. Take your time. But know that the letting go is very rewarding. On an unrelated note, that is a banana bread recipe I can get behind. Thank you! I so love how the entire slowly evolving experience of pregnancy prepares one for being a parent. You said it so well. Congrats to you & Sam. Thanks for the WW banana recipe. I'm always on the look out for good whole wheat quick breads. I feel like I should apologize for writing another comment. :) But I felt like sharing two things-banana rye muffins first (I used ww and rye flour, leftover oatmeal...I think Molly/Orangette adapted something from Good to the Grain). Terrific. Two: while similarly pregnant (and in mid-summer), we road tripped 5000 from Boulder, through the NW, and down to San Diego. I felt pretty swell most times, but my swollen feet and legs were by far the worst part (really of the whole, primarily easy pregnancy). Thankfully, I had a week in a lovely hotel (and pizza in San Diego's Little Italy) to recoup before the long, quick haul back to Colorado. Cheers to the rest of the journey, and I'll keep my fingers crossed for more of the cooler we've been treated with in Wa this past week (the heat is killing me, and I'm not pregnant). You're doing great, Mama. Being willing to release expectations and surrender to your body and baby is a skill that will serve you well in the days ahead. And you're realizing it now instead of halfway through labor? You're ahead of the game! Rooting for you all the way. Every time I think of you as a mama I smile! So exciting - and before you know it you will be stirring up this bowl of banana bread with a wee one standing next to you offering their hands to help! Aww, thank you D. Miss you! Aw-I loved reading this! And while being a parent is incredibly humbling and unpredictable (obviously), I think your life philosophy of working hard and expecting it all to work out will still apply perfectly :) Congrats to you guys! Hope you still keep feeling as great as humanly possible. Quick question for the banana bread-is it possible that the amounts for the baking soda/baking powder are off? I made it last night and it overflowed! I could be totally wrong but it did seem like a lot, and I can't think of anything else that could have been the cause. I didn't have any whole flax seeds and ended up using my coarsely ground flax but nothing else was different. Bread still tasted great! Do you think I could replace the flax seed with spelt? I happen to have that on hand but i am not that familiar with how spelt tastes so wasn't sure if it would work in this recipe. This isn't so much a reply to this recipe--though, your post was so aptly timed: it popped up on my instagram at the tail end of my own by-a-lake-in-the-Adirondacks vacay that started with Smitten Kitchen's double choc banana bread squeezed into a carryon & ended with an incredible brown butter grilled (!) version at a Maine diner and my own reflections on how my favorite food bloggers come back to banana bread again and again, and how into. that. I am, and then--tada! I have been making this banana bread for a while now and recently they have began to sink quite a lot in the middle. I substitute honey for maple syrup and always quadruple the recipe. Any advice? I also live in Singapore where the climate ie very hot and humid although the kitchen is air-conditioned. Thank you!! Mine exploded too - watching it go over the edges of the loaf pan as I write. I have to think it should be teaspoons instead of tablespoons for the BS/BP measures? Made this today--I doubled the recipe so I ended up with one loaf for a gathering and another for our family! Came out very well. I did halve the baking soda to about 1/2 Tbsp for the two loaves because the amount in the recipe seemed like too much. So sorry for the delay. So funny because I literally just made a loaf today. I have no idea if it'd work but I feel 90% sure that it would. My only thought: bananas offer some sweetness here, so I'd almost up the brown sugar by 2x to be honest (as much as I don't love adding extra sugar when it's not needed). Let me know how it turns out!